"Kevin went above and beyond to install job. Very..."
For a FREE no-obligation estimate in Mount Pleasant, SC, please fill out the form to the right and Carolina Energy Conservation will contact you shortly. Brand new home, not satisfied with insulation. Interested in closed cell in rafters and crawl space. House is in an AE flood zone, so it is raised 6'. Single story with 2410 square feet. Also considering solar. I RECENTLY HAD A HOME INSPECTION FOR BONDING & TERMITES. THEY POINTED OUT I NEEDED TO DIVERT MY AIR CONDITIONER DRAIN AWAY FROM THE FOUNDATION & NOTED SOME FIBERGLASS INSULATION WAS FALLING DOWN IN THE CRAWL SPACE. THIS IS D/T THE HIGH HUMIDITY IN THE AREA. I NEED AN EVALUATION ON OPTIONS TO PROCEDE FORWARD . Need room above the garage insulated. I'm interested in having our attic spray foamed. Our house is 1661 sq feet. Thanks! Minor musty smell, condensation around can lights in bath and closet, and possible slight mold in attic area above one side of the house. Home inspector advised to get an opinion on removing blown in insulation and redoing with foam. The foam will seal the attic area much better and help lower the hot air in the summer in the attic area. The attic roof is shallow which may present a problem for spray foaming. However, I would like to see if it can be done and the price. Looking to experience additional comfort and energy savings in your home? Carolina Energy Conservation can provide you with a home energy audit to discover what work needs to be done. We offer these services to residents of Mount Pleasant and nearby. We perform a home energy audit before we make any recommendations about improving insulation and air sealing. Once the evaluation is complete, we take the time to sit down with you to discuss the results and help you make the best decisions for you home and family. Many people do not know that your cold floors could be due to a lack of proper insulation underneath the home. Christopher noticed that his floors were awfully cold in the winter months. After checking out the insulation in his crawl space, he saw that the insulation that was supposed to be keeping his floors warm, was low hanging and falling down. This prompted him to call Carolina Energy Conservation. Shortly after giving them a call, Bill Gallagher visited the home to evaluate the issues that Christopher was having. Bill then sent Joe Ellis and his crew out to the home to fix the problem. The crew removed the existing insulation and then applied closed cell spray foam to the underside of their floors. Along with providing quality insulation, spray foam insulation air seals the areas that it is applied. This closes off any areas in the crawl space that may allow air to freely flow through cooling the floors above. Christopher is very happy with his installation and is looking forward to warm feet next winter. The best part is that spray foam doesn't shift or settle so his floors will be warm for many years to come! 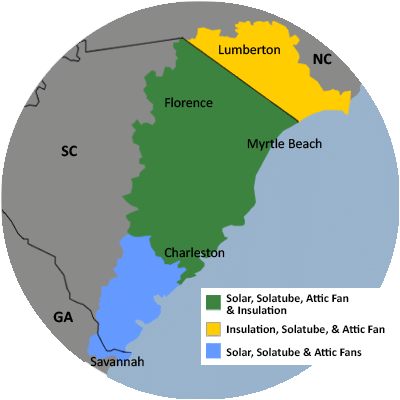 Looking at getting a solar attic fan installed to assist with attic heating. We already have a radiant barrier on the roof of the home, so I am wondering if an attic fan would also help. I have a few interior walls that could use insulation. We are interested in blown in insulation to reduce sound transmission. Need light in my living room and was impressed with neighbors solatubes. Crawl space. 300sq ft house. remove and replace insulation. Crawl space very open and no insulation underneath. Would like a consult to determine if there are things we could do to our home to save on energy bills.